Crux provided geotechnical drilling and sampling services to aid in the design phase of the expansion project. This included drilling fifteen boreholes, eight of which utilized standard track vehicle access, and seven of which required helicopter-supported drilling. 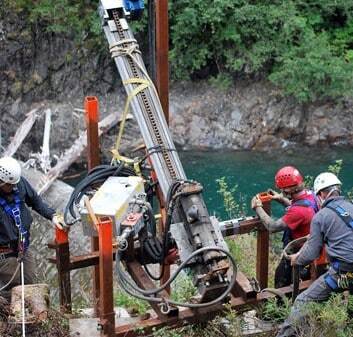 Crux employed a combination of HQ and HWT coring to drill more than 1800 feet. 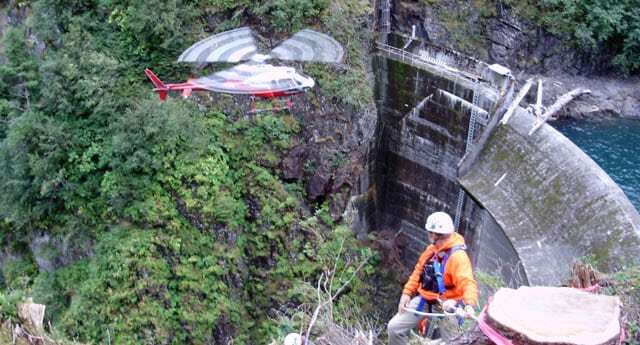 One of the helicopter borings was located on a vertical cliff face and required innovative access methods. Crux utilized helicopter drilling techniques to install four rock anchors above the boring location, and secured a suspended certified engineered drill platform to these anchors. Equipment was then transported by helicopter to the platform. Crux operated two component drills simultaneously while completing the helicopter portion of the drilling to reduce the total project duration associated with helicopter work and to minimize overall project costs. Crux performed packer testing in the borings and provided the client with down hole feature orientation using our in-house Crux Oriented Borehole Logging (COBL) services. COBL utilizes high resolution optical and acoustical probes to obtain images of the borehole wall, providing wrapped and unwrapped 360 degree views of the borehole as well as strike dip information of fractures. Crux introduced two key alternatives to original project specifications that provided the owner with significant benefits. The first was to provide a contract helicopter, effectively eliminating potential project delays associated with helicopter mobilization from Juneau to the project site. Having a responsive onsite helicopter in the event of an injury also increased overall project safety. The second alternative Crux provided to the owner was the use of COBL for obtaining down hole feature orientation in place of the specified Ballmark system. The use of down hole televiewersystems are less labor intensive, provide a significant amount of data, and eliminate the human error associated with field personnel handling marked core, all of which provides the client with higher quality data. Overall, Crux’s experience and specialized equipment provided the client with a safe and productive project. For more information visit Crux Subsurface.